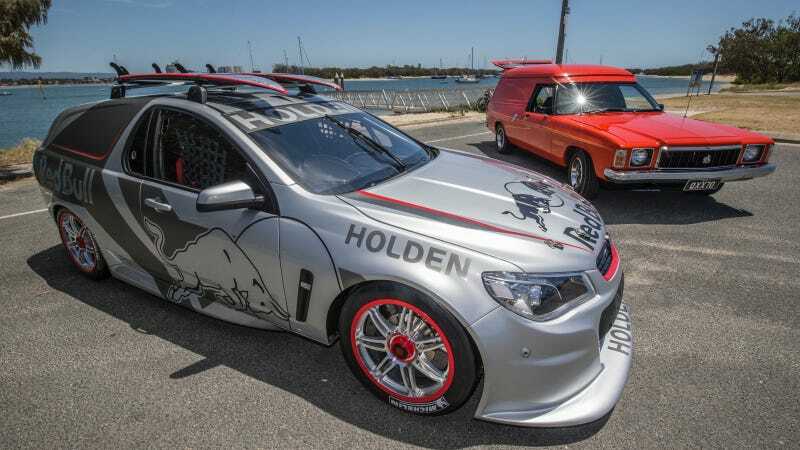 Red Bull Racing Australia had the quintessential Aussie shaggin' wagon in mind when they cooked up one of their latest projects: a modern-day recreation of the legendary Holden Sandman. This video shows how they based it on a V8 Supercar and loaded it with awesome tech they can't run in the series. Wagons are great. You can destroy all the tires and haul them home in the hatch. This one has the added functionality of fitting the stock Holden roof bars to the top as well. Who needs a hauler? This wagon in particular is a step up from the Red Bull Racing Holdens you'd usually see on track, featuring a larger stroker V8 engine and bigger wheels. The Triple Eight Race Engineering squad behind Red Bull Racing went nuts with the package, giving the lightweight race car 700 horsepower. Forget the Hellcat; I want this. Drive-by-wire and pneumatic paddle shifters are the two biggest differences from the team's race car. V8 Supercars use a cable-operated throttle system and a mechanical shift lever instead. Project Sandman allowed the team the opportunity to apply those technologies to a car to see if they would work. "Not just to be ahead of the game, it's to then suggest it to V8 Supercars and say, 'hey look, we've got a proven system everyone can now use.' It's a holistic view that we want the category as a whole to grow and progress," explains Team Manager Mark Dutton. Everything about this is awesome: the sound, the shape, and seeing a surfboard-laden car lay down a fat set of elevenses and whip around the Gold Coast 600 street circuit.